Copyright © 2013 Sultan Z. Alamri, Abeer A. Alenezi. This is an open access article distributed under the Creative Commons Attribution License, which permits unrestricted use, distribution, and reproduction in any medium, provided the original work is properly cited. Using the vortex filament model with the full Biot-Savart law, we show that non-straight bundles of quantized vortex lines in HeII are structurally robust and can reconnect with each other maintaining their identity. We discuss vortex stretching in superfluid turbulence in many cases. We show that, during the bundle reconnection process, Kelvin waves of large amplitude are generated, in agreement with previous work and with the finding that helicity is produced by nearly singular vortex interactions in classical Euler flows. The reconnection events lead to changes in velocities, radius, number of points and total length. The existence of reconnections was confirmed by other authors using the model of nonlinear Schrödinger equation (NLSE). Our results are agreed with the finding of other authors and extension to our numerical experiments. A quantived vortex is different from a vortex in a classical fluid where the circulation is quantized, which is contrary to a classical vortex that can have any value of circulation . where is the order parameter filed, is an external potential, is a coupling constant, and is the mass of each particle. This description is most applicable in the limit of , where the normal fluid is absent. This model can also be used to explain phenomena related to vortex cores, such as nucleation and reconnection. 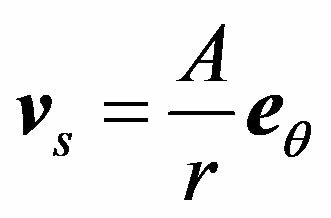 However, the GP model is applicable to Bose-Einstein condensation of a dilute atomic Bose gas. It is, however, not applicable quantitatively to superfluid 4He, which is not a weakly interacting Bose system. For more details, we refer to Refs. [8-10]. 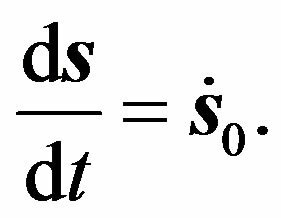 The second formulation for studying the dynamics of quantized vortices is called the vortex filament model. 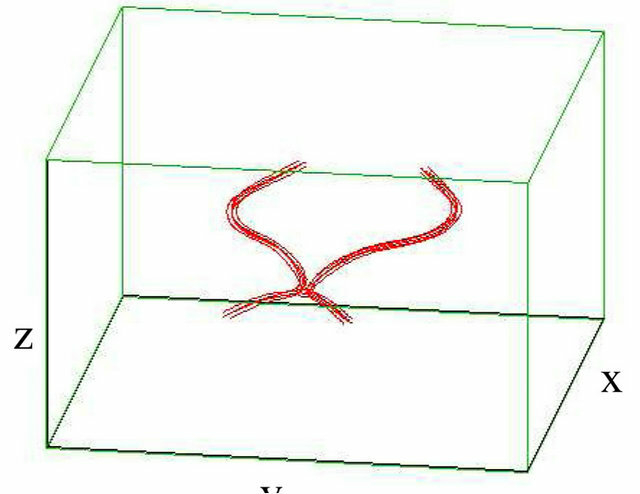 The aim of this work is to use this model under the full Biot-Savart law to make numrical simulations to examine the dynamics of inviscid vortex filaments, specifically what happens at vortex including reconnection events. This model was pioneered by Schwarz [11,12], where the vortex lines are numerically discretized by a large, variable number of points depends on the local radius of curvature. We will briefly describe this model in the next section. In our numerical experiments we use the model of Schwarz which is explained in detail in Ref. . The filaments are discredited into a large variable number of points, N; this (Lagrangian) spatial discretization depends on the local radius of curvature: vortex points are removed in regions where filaments straighten and are added where the local radius of curvature becomes smaller. The time evolution is computed using a fourth order Runge-Kutta scheme with fixed time step . The first and second derivatives in Equation (8) can be computed by using the central difference formula which is second order in space . 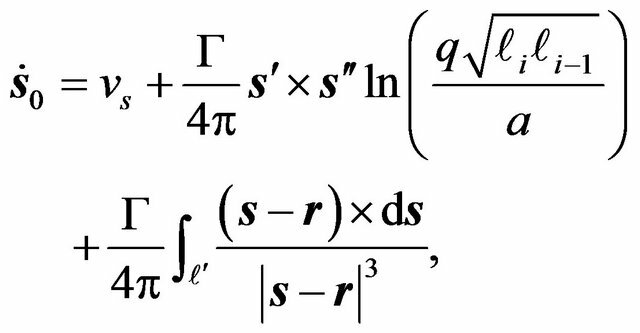 So, for a vortex configuration modeled by vortex segments, we must solve a system of coupled first order differential equations. 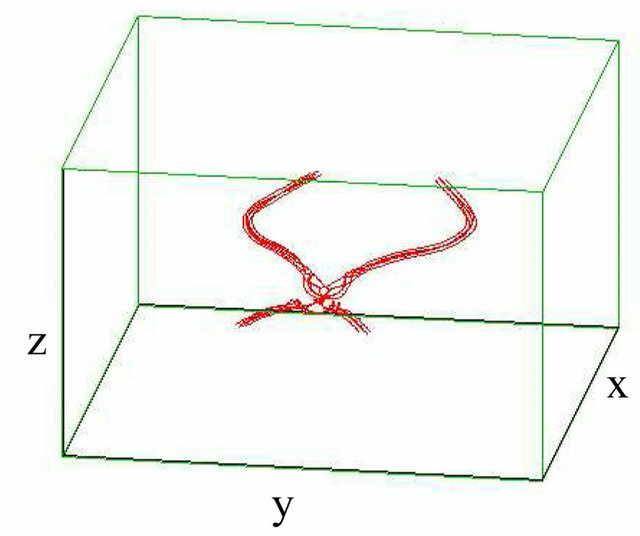 Our simulations are performed in a cubic box of volume , where (typically, we chose or ) with periodic boundary conditions. 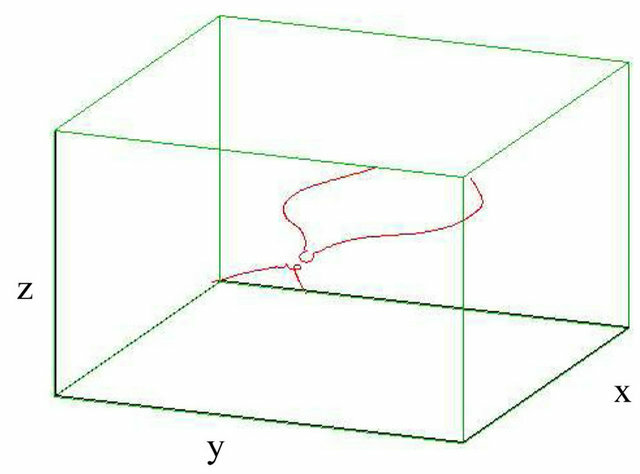 In this work, we use the vortex filament model in which vortex reconnections are performed by the numerical algorithm (rather than occurring as natural solution of the governing equation, as in the model of nonlinear Schrödinger equation (NLSE)) [18,19]. In our method, we firstly select these points which are candidates for a reconnection. 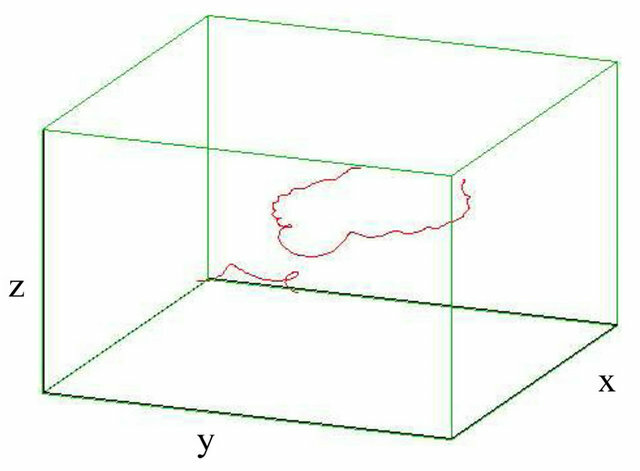 This selection is based on the distance between those points, where the reconnection between two lines can takes place only if they have different directions. For more details, we refer the reader to Refs. [20-22]. By using the vortex filament method, we study the interaction of two non-straight vortex bundles (with sinusoidally) each one of them contains a given number M of (initially) non-straight parallel vortex strands, set (initially) at (vortex with antivortex bundles). 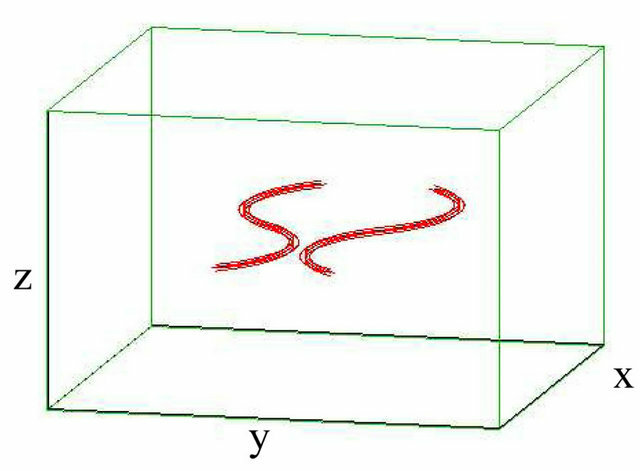 If two vortex strands become closer to each other than the local discretization along filaments, then, consistently with the orientation of the filaments, our numerical code reconnects the strands, provided that the total length is decreased . 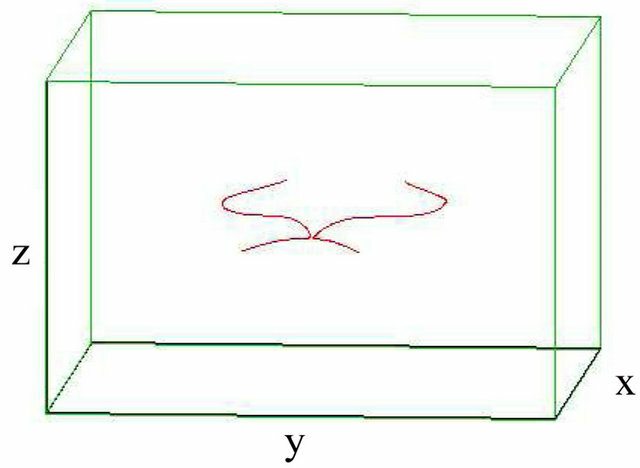 As first, we set a single vortex with a single antivortex as shown in Figure 1, and we found that the two vortices trend to each other and the reconnection between them takes place. These results are in agreement with the finding of Koplik and Levine , who used the NLSE model. 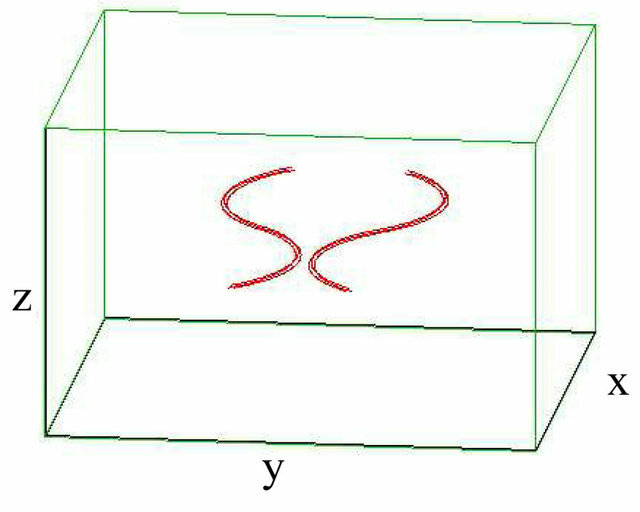 In the case of bundles, the initial position of vortex strands within the same bundles is symmetric, and we found that the reconnection events are still possible in different values of M. When M = 3, we place three vortices at the corner of a equilateral triangle. The interaction between the bundles makes them to bend in the direction of each other, until , the first reconnection takes place. With the evolution, the second reconnection is found at , then they become free from each other at , and move away, see Figure 2. Figure 1. Reconnection of single vortex and single antivortex (with sinusoidally) strands each when . (a) t = 0 s; (b) t = 6.75 s; (c) t = 7.5 s; (d) t = 12.5 s.
Figure 2. Reconnection of vortex bundle and antivortex bundle (with sinusoidally) strands each when and M = 3. (a) t = 0 s; (b) t = 6.75 s; (c) t = 7.5 s; (d) t = 8.25 s.
Figure 3. 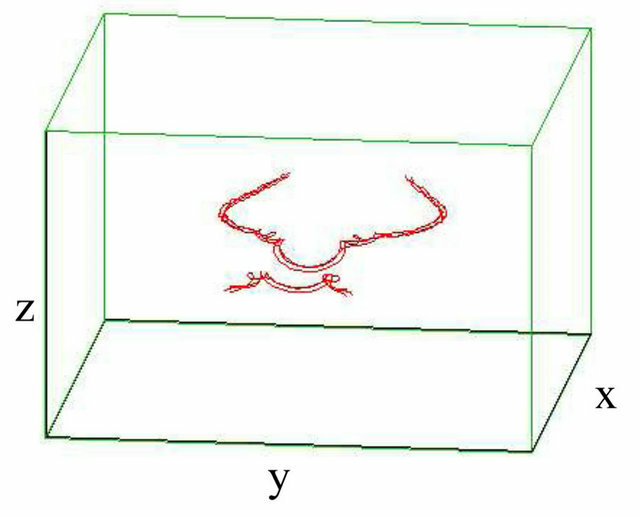 Reconnection of vortex bundle and antivortex bundle (with sinusoidally) strands each when and M = 5. (a) t = 0 s; (b) t = 6.75 s; (c) t = 8.25 s; (d) t = 10 s.
Figure 4. Corresponding to the evolution shown in Figure 3. (a) Total vortex length L versus time t; (b) Average inverse radius of curvature versus time t; (c) Number of discretization points N versus time t; (d) Average velocity of vortex points versus time t.
nection, see Figure 3. The upper-right panel of Figure 4 shows the average inverse radius of curvature, , obtained by computing at each discretization point and then averaging over all discretization points. As a result of the increase in and the decrease of , the number of discretization points (initially ) grows with time up to when we stop this particular calculation as shown in the lower-left panel of Figure 4. As shown in the lower-right panel of Figure 4 the decrease of causes the increase in the average velocity of vortex points. These calculations are performed in a cubic periodic box , where . This work deals with the numerical simulation of the motion of inviscid vortex filaments under full BiotSavart law. The calculations presented here were made when the periodic boundary conditions are applied in all axes. The very known fourth order Runge-Kutta method was used for the time evolution. The reconnection and vortex stretching in superfluid turbulence is concerned. 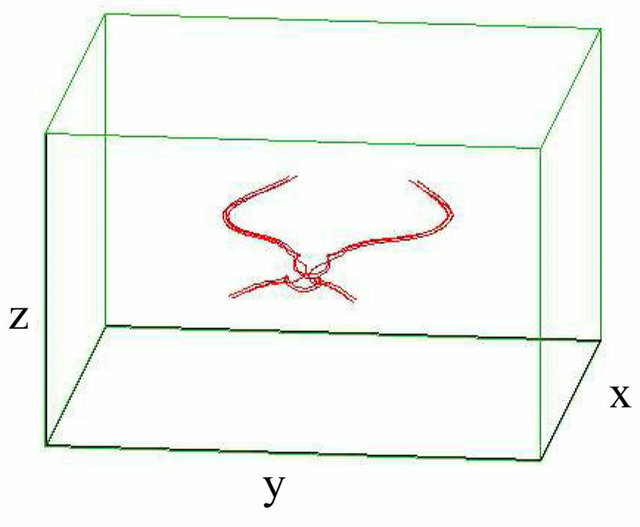 The existence of reconnections was proved by Koplik and Levine  using the model of nonlinear Schrodinger equation in order to confirm Schwarzs insight that quantized vortices reconnect . We found that the single vortex with single antivortex can be reconnect together by using the vortex filament method as confirmed beforetime by Koplik and Levine . 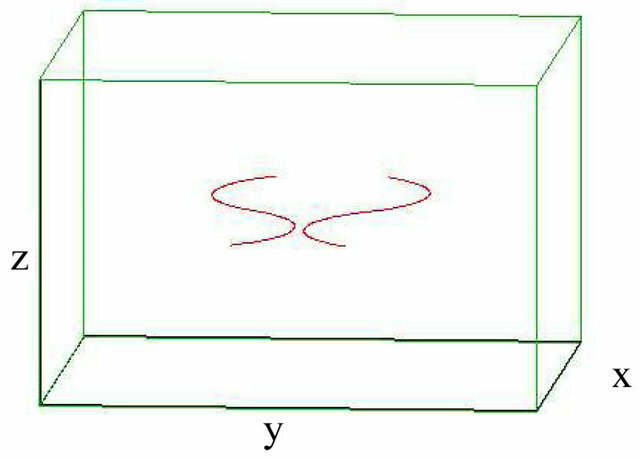 A noteworthy feature of the reconnection between two vortex lines is the ability of their reconnection can be takes place only when they have different directions. Our main finding was that non-straight bundles (with sinusoidally) of quantized vortex lines in He II are structurally robust and can reconnect with each other maintaining their identity. 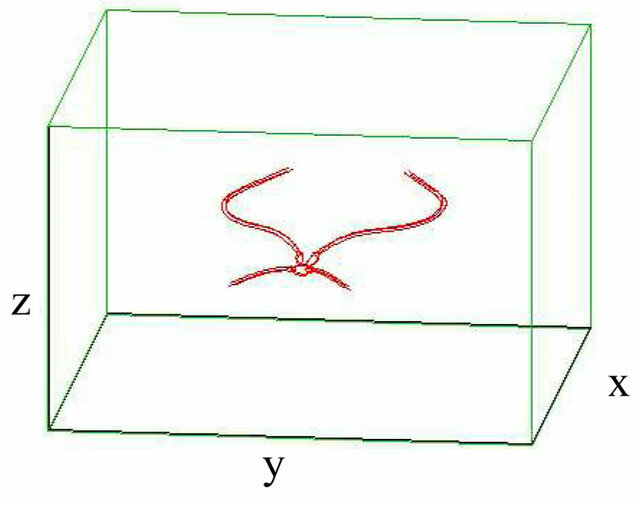 The interaction between two bundles makes them approach each other closely and then the reconnection occurs one by one after which the two bundles separate from each other. This is in agreement with our previous experiments . 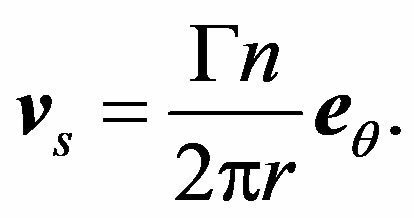 This leads to increasing in total length, velocity and the number of vortex points and decreasing the average radius of curvature. The authors are grateful to Prof. Carlo F. Barenghi and Prof. Eed M. Darwish for useful discussions and a critical reading of the manuscript. This work is supported by the Deanship of Scientific Research at Taibah University (Project No. 1433/1790). R. Aarts, “A Numerical Study of Quantized Vortices in He II,” Ph.D. Dissertation, Eindhoven University, Eindhoven, 1993. R. J. Donnelly, “Quantized Vortices In Helium II,” Cambridge University Press, Cambridge, 1991. 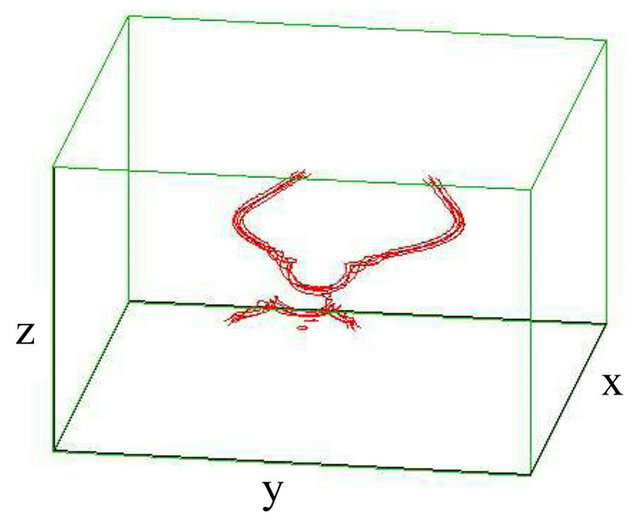 F. Maggioni, S. Z. Alamri, C. Barenghi and R. Ricca, “Kinetic Energy of Vortex Knots and Unknots,” Il Nuovo Cimento C, Vol. 32, 2009, p. 133. A. J. Allen, P. M. Chesler and H. Liu, “Holographic Vortex Liquids and Superfluid Turbulence,” arXiv Preprint [hep-th]: arXiv:1212.0281. S. Z. Alamri, “A Numerical Study of Quantum Turbulence,” Ph.D. Dissertation, Newcastle University, Newcastle, 2009.